This entry was posted in Fun & Games, Hilarity of the Week and tagged facebookcomments, fun polls to vote on, fun stuff to share on facebook, funny facebook comments, funny people on facebook, funny stuff on facebook, funny stuff online, hilarity of the week, mrs white, wifetime. This entry was posted in Fun & Games, Hilarity of the Week and tagged fun stuff online, fun stuff to share, funny comments online, funny facebook, funny facebook comments, funny people on facebook, funny people online, funny polls, hilarity of the week, mrs white, mrs white hilarity of the week, polls to vote on, shares for facebook, things to share on my facebook page, voting polls. This entry was posted in Hilarity of the Week and tagged facebook funnies, fun polls, fun things to share on facebook, funny facebook, funny facebook comics, funny jokes, funny jokes on the internet, funny people on facebook, funny stuff online, funny voting polls, polls to vote on, things to vote on. 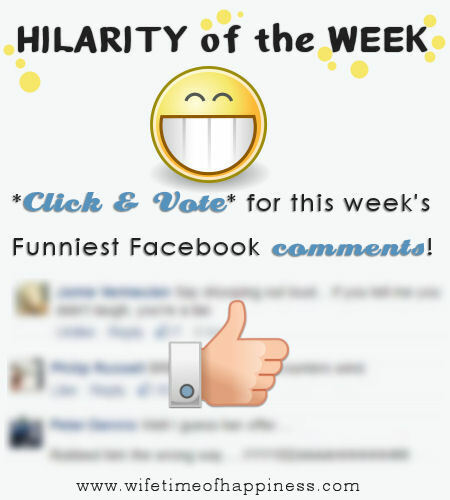 Hilarity of the Week: Funny Facebook Comments! New Year, Fresh New Humor! Welcome to Wifetime of Happiness' Funny Facebook Comments Competition. Welcome old and new readers! This entry was posted in Fun & Games, Hilarity of the Week and tagged facebook funnies, funny facebook, funny facebook comics, funny jokes, funny jokes on the internet, funny people on facebook, funny voting polls, polls to vote on, things to vote on. This entry was posted in Fun & Games, Hilarity of the Week and tagged facebook, facebook comments, funny comments, funny comments found online, funny comments of the week, funny comments online, funny people, funny people online, funny stuff to read online, hilarity of the week, mrs white funny facebook comments, mrs white hilarity of the week, weekly funnies. Fresh New Year, Fresh New Humor! This entry was posted in Fun & Games, Hilarity of the Week and tagged funny comments of the week, funny comments on facebook, funny facebook comments, funny stuff from facebook, hilarity of the week. This entry was posted in Fun & Games, Hilarity of the Week, polls and tagged facebook shares, fun polls to vote on, funny facebook, funny facebook comments, funny online comments, funny people online, funny polls, funny shares for facebook, hilarity of the week, october funny comments, read funny online comments, voting polls.